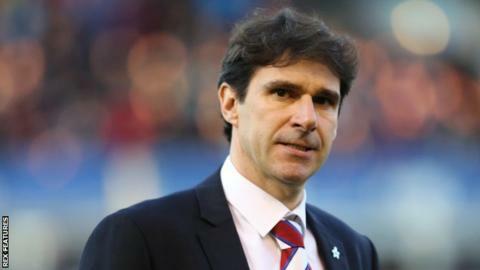 Middlesbrough head coach Aitor Karanka says his side fully deserve to be top of the Championship table with three games left to play. Boro are unbeaten in their last seven matches and are two points clear of second-placed Burnley, who drew 1-1 with Karanka's team on Tuesday. "We are top of the table because we have an amazing squad and we have an amazing club," Karanka told BBC Tees. "We are in a privileged position and we showed everyone we are a good team." He added: "If we are at the top of the table at this point, it is no coincidence. "We can say that we've lost two points, but I prefer to keep calm with the performance and with the players." Jordan Rhodes gave Boro the lead with 20 minutes left to play against Burnley, but Michael Keane's 92nd-minute equaliser rescued a point for the Clarets. "The way we were playing it was difficult to lose, but we played really well and everybody could feel at home and feel the difference between us and Burnley," Karanka said. "We have a lot of different ways to get the ball into the box and they have just one: long balls." Middlesbrough face Ipswich and Birmingham City before they meet promotion-chasing Brighton at the Riverside on the final day of the season. "At home we are a really confident team and we have won the last three games there," Karanka said. "We need the supporters' help because we're going to need everything at this point of the season, where every point is gold."